Another bogus scandal by the democrats, played out by their media, based on nothing, attempting to destroy the Bush Administration, no matter what the cost on the country, etc. 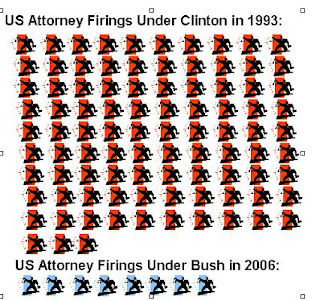 Although there is no evidence that there was any illegal action in the firing of 8 US attorneys- compared to the 93 US Attorneys fired by Bill Clinton– the democrats are demanding emails from the White House to see if they can build some kind of scandal anyway. The White House says they were erased. The media speculates on the non-scandal. And, a scandal-plagued democratic senator leads the charge on the White House. It’s not clear what is more revolting… Propping up Al Sharpton and Jesse Jackson as race czars or watching the media make Senator Patrick Leahy appear to be an upstanding politician? No senator has been disciplined for leaking since 1987, when Senator Patrick Leahy (D-VT) was forced to give up his seat on the powerful Senate Intelligence Committee. It was discovered he leaked classified information to reporters. Now he’s on the Senate Judiciary Committee which is currently investigating top secret information regarding the NSA surveillance activities. To show they really do care about the future of this great country, the democrats will be hosting the Muslim Brotherhood in a joint session of Congress soon!